In the Trump Age, fact-checkers are "liars." The media is "unbelievably dishonest." Journalists have been bullied and neutered. Trump's utter disdain for the media is palpable. It's a visceral hatred which stems in part by his confusion in thinking the Fourth Estate is merely an extension of his PR team. 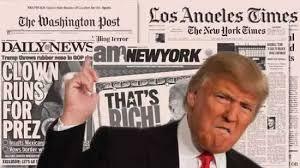 He lacks the respect and appreciative for a free and open press that is the bedrock of a democracy. Pathologically in perpetual search of acceptance and affirmation, Trump summarily rejects anything and anyone who fails to show him love. Challenge him, question him, show him no intrinsic loyalty and Trump the "counter-puncher" will pummel you. And therein explains his dysfunctional, hostile relationship with the press. The result was a series of belligerent Tweets from Trump. Personal attacks about Jones' character and the performance of his union's workers. Courtesy of our first Twitter Troll-in-Chief.